After I took a class to learn how to make earwires, I started thinking about what else I could make with wire and different sized mandrels. I have been wanting to make my own wire findings. I have even played around with a jig, but we'll get to that later. 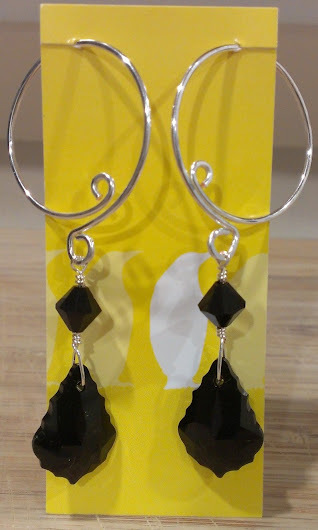 This Christmas, I made earrings for my in-laws, including my stepson's mother. She has gauged ears, so I decided to try making earwires for gauged ears based on what I thought would work. What I came up with was a fun, swirly hoop. After making them, I thought they would also make a fun finding for earrings as well. 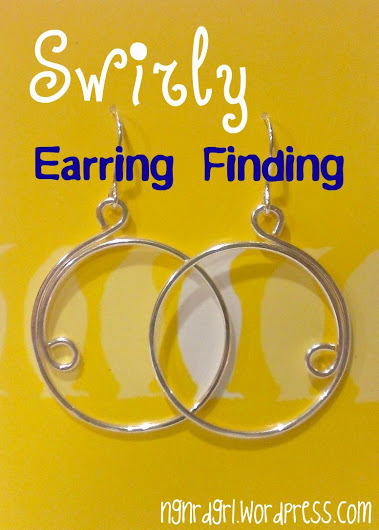 Thus, my swirly earring finding was born! 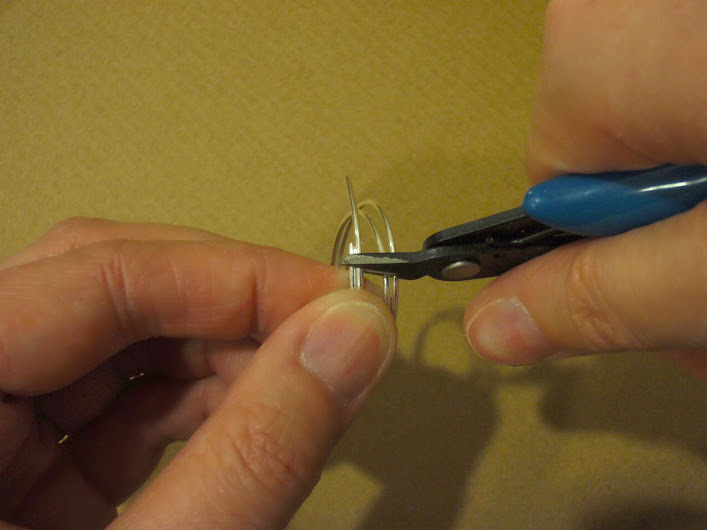 Here are a couple tutorials that will aid you in working with wire. Please give them a read. 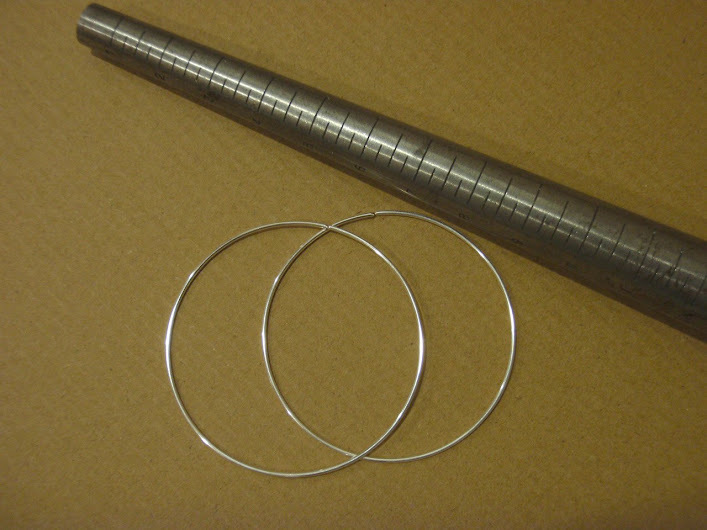 Wire 1: Basic Loop – required for a basic understanding of wire working, work hardening, basic wire tools (pliers, wire cutters), eye fatigue, etc. 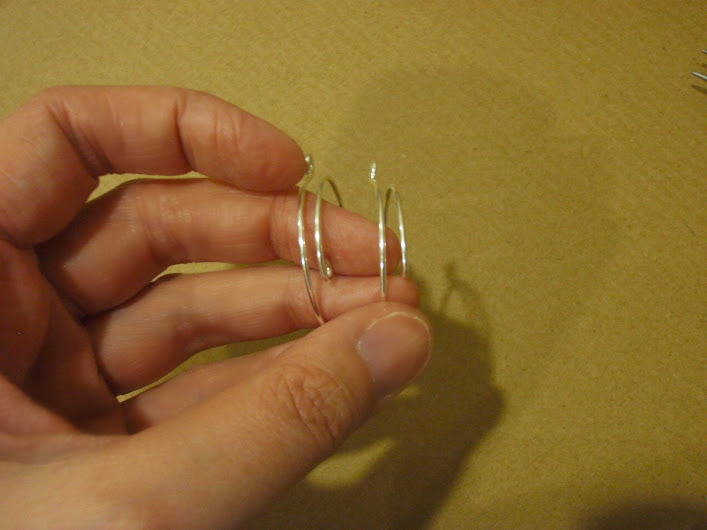 Easy Peasy Earwires - working with mandrels and tools for hardening wire. 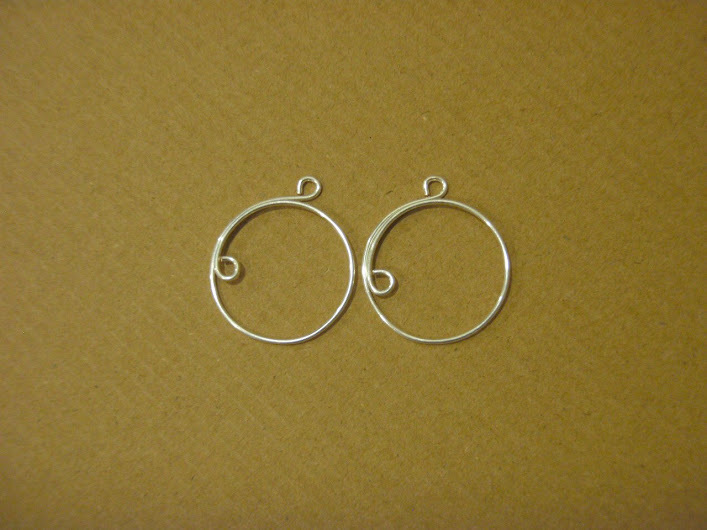 18 or 16 gauge, half hard, German jewelry wire - remember, the smaller the number the thicker the wire. 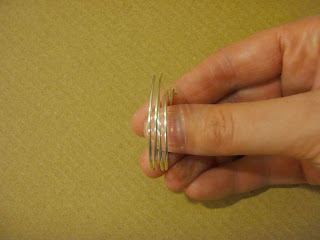 I used 16 gauge wire; however, this wire is pretty thick and may be a little more challenging to work with. I think 18 gauge wire would have worked just as well. Read my Wire 1 review for more information on wire and hardness. Mandrel - a mandrel can be anything. In this tutorial I used a finger mandrel; however, I could have used a prescription bottle or a bottle from my spice rack. 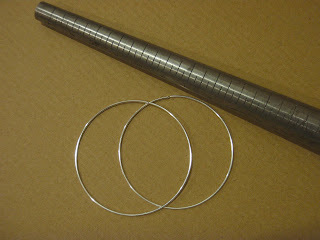 Choose a mandrel slightly smaller then your desired shape, since the wire will spring out to a larger size. 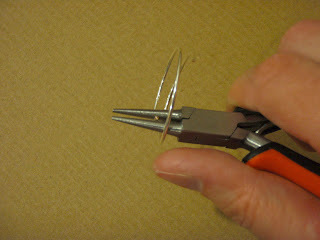 For information on side cutters and pliers, see my Wire 1 tutorial. 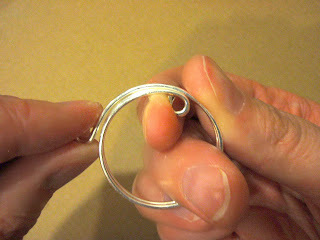 For the hammer and bench block, see my Easy Peasy Earwires tutorial. Cut 2 lengths of wire roughly 4" to 6" long. 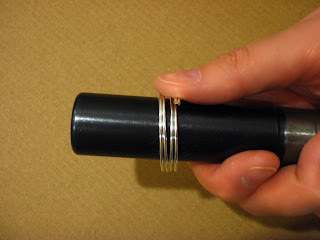 Pictured is my ring mandrel, which I used the handle (widest part). Wrap both wires at the same time around your mandrel. This is how they will look once taken off the mandrel. Two circles of wires nested together. The wires will overlap with themselves. 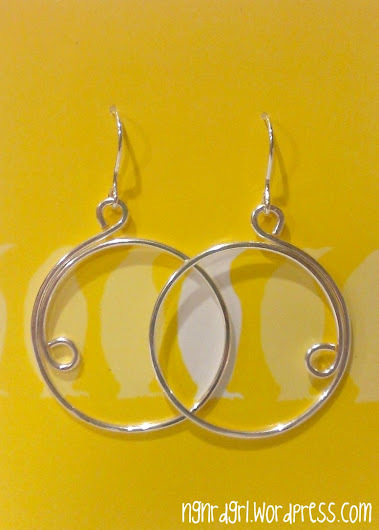 When I made these, they almost completed two full circles. Use your needle nose pliers to create a P loop. Form the P first towards the center of the circle. To form the loop, start at the very end of the wire, wrap the wire around the pliers' nose, then rotate the pliers and complete the loop. Work your wire circles one at a time. After completing the inner P loop, this is how they will look. My second one didn't match the second, so I just cut it off and tried again. Next, line up the P loops so they are even with each other and cut the wire ends simultaneously. Using your needle nose pliers, form a P eye on the end of the wire. Form the P away from the center of the wire. Work each circle separately. The circles are three dimensional and don't lay flat. Use your fingers to rotate the circles sideways, the same way you open and close a loop. Gently do this until the circles lay flat. Hammer the circle to the desired flatness. This will also help the wire remember to stay flat. After hammering, your finding may have lost some of its shape. I found that they were no longer quite even and the eyes had elongated, making them not fully closed. I used my fingers to gently close the larger circles into a similar shape. I would normally just put it back on the mandrel, but the inner P prevents this. I also used my needle nose pliers to close the P eyes. Attach your earwires. 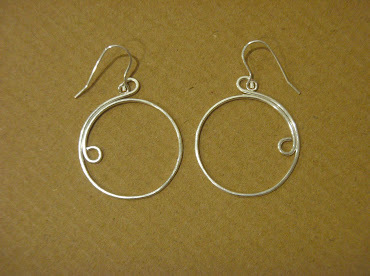 I used my french hook earwire I made for my Easy Peasy Earwires tutorial. 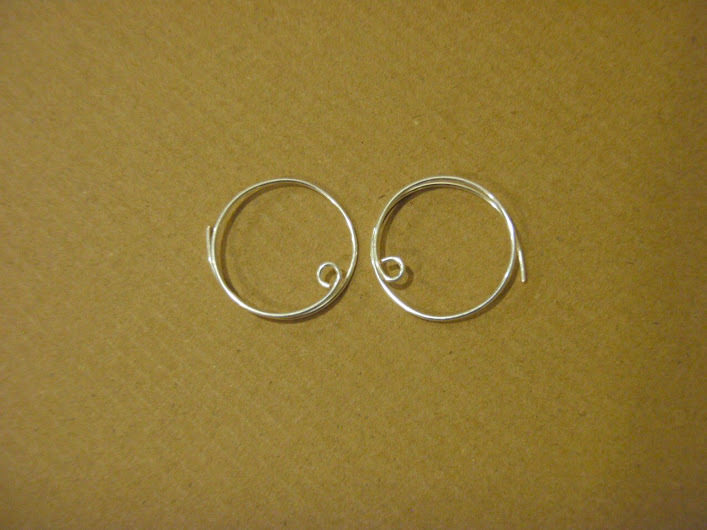 You may want to make your earwire such that the eye faces forwards, perpendicular to the hook. This would allow the hoop to lay flat against the face. The way I made it the circle sometimes lays flat against my face, but prefers to face forward, showing off it's shape. 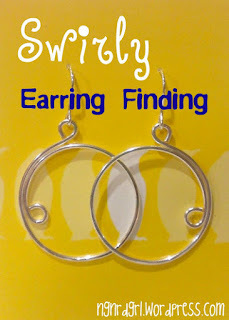 You could also flip the finding over and attach the earwire to the larger circle, allowing it to be loose in the earwire. 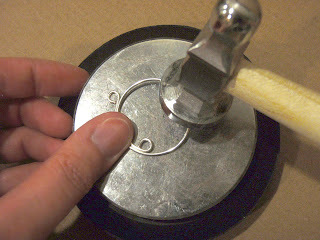 You could then attach beads to the outer P, which is now at the bottom. This is how I made the earwires for my stepson's mother, who has gauged ears. I used the same thank you card stationary from my previous project to make jewelry cards for this project. I LOVE the yellow background in contrast to the black beads. So what do you think of my new earrings? Hey, would love if you thought about guest posting one of your projects at Inspiration Cafe sometime! Wow, girl! You've definitely got some sweet jewelry making skills. I am definitely a hoop girl - - I have a few faithful pairs I always turn to when I'm not sure what will work best - - they always come through in a pinch. And the stationery you used as your backing is so bright a beautiful - - nice choice there. Thanks for sharing this lovely tute and your beautiful creations with us. Thank you, Lauren! 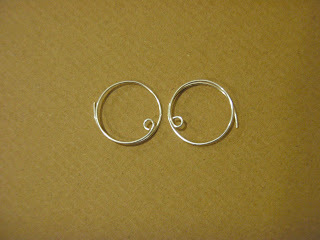 I am getting more into hoops these days. I'm really digging these earrings. They are super light weight and fun. I'm really happy with how that stationary turned out. So much so, I had to make a second card for me! Thank you so much for inviting me! I am really flattered. I just read the "How to Write a Guest Post." I've followed you on Facebook and Pinterest as well as following Inspiration Cafe through bloglovin'. I will send you an email. You really do have some mad skills...this is a great tutorial for someone like me who can barely thread a needle.. Love the earrings!!! Thank you!!! They are pretty fun. Thank you! I am really happy with how they turned out. I love your design! It's so pretty, creative, and versatile! Nicely done! Thank you! Your Pin Me party is great! I just sprinkled this post at all my favorite places!! Thank you so much!!! I was over the moon that you featured me. I am really excited about it! Thank you!!! I love this!! The black and silver looks so great! I love how the black and silver look on the yellow card. It turned out really well and really fit the person I was giving it to. Thanks for stopping by!